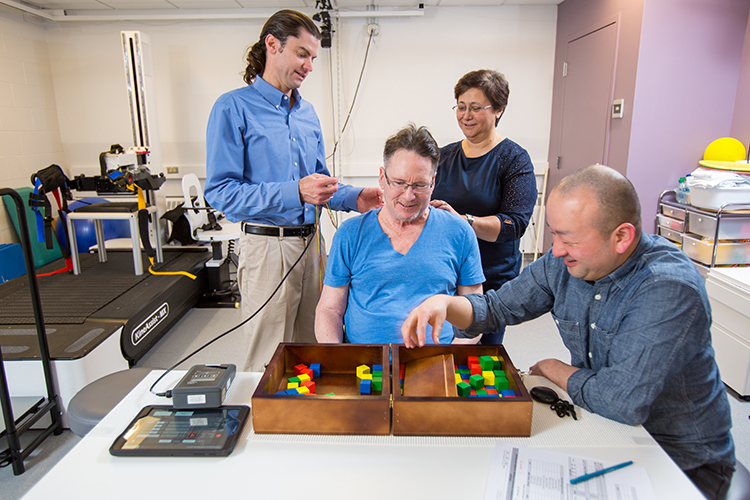 UWIN/Center for Neurotechnology (CNT) graduate fellow Soshi Samejima, and UWIN faculty member (and CNT Co-Director) Chet Moritz were featured on King 5 News for their research which resulted in a successful spinal cord rehabilitation trial. The article focuses on the study participant, Joe Beatty, who suffered a spine injury which left him with a “future life without the use of his limbs.” During the course of the study, Joe has regained some fine control in his limbs, going from having “a difficult time to feed himself, grabbing thing, grasping utensils” to movement that is “improved where he can grab sandwiches, he can grab a remote, grab his cell phone,” even walking with some aid for up to eight minutes. With defined improvements in Joe’s movements, the initial trial has been a success and the Center for Neurotechnology is looking to refine and expand the new method of rehabilitation for chronic spinal cord injuries. Dr. Mortiz and his team changed the traditional invasive methods of spinal cord rehabilitation by applying transcutaneous electrical simulation – that is, stimulation of spinal cord circuits through the skin. This noninvasive electrical stimulation happens at the same time that the patient performs movements, and the stimulation allows the patient to move better than without stimulation. Repeated sessions even lead to long term improvements, although the exact mechanism has not been solidified. Currently, Dr. Mortiz and his team believe that by having the simulator firing at the same time that the patient practices movements, the patient can rewire the connections between the neurons in the brain and the spinal cord, leading to long term changes. With initial success in nerve stimulation trials, the study plans to expand to four other states with the intent to design individual units that patients can take to their house in order to provide convenient ongoing treatment. Learn more about this research on the Center for Neurotechnology website and in the study’s associated paper. Soshi Samejima was awarded a UWIN graduate fellowship in 2017. Chet Moritz, in addition to being the CNT Co-Director and a member of the UWIN Executive Committee, is part of the team running the Laboratory for Amplifying Motion and Performance (AMP Lab). He was also part of the team awarded a $1 million prize as part of reaching the finals in the GlaxoSmithKline Bioelectronics Innovation Challenge.